Jo Ann LeSage Nelson, APR, is vice president of client services for Pierce Communications, an Albany-based public relations/public affairs/crisis management firm, where she is responsible for strategic public relations and communications counseling for Pierce Communications clients. She is an accredited member of PRSA and is currently serving her second term as a member of PRSA’s national board of directors. She is the first Capital Region (NY) public relations practitioner to serve on the organization’s national board and executive committee. My first job out of college was as an editor for a large financial services firm. That’s where I honed my editing and proofreading skills to the point they are at now. I can spot a typo a mile away! The rest of my career has been spent in public relations, first at a community hospital, then at a large chamber of commerce, next at a Capital Region PR agency, and for the last 12 years at Pierce Communications. I have a job I love and am always grateful that I chose this field over the field of journalism that I initially intended to pursue. I have served on quite a few boards of directors, and currently serve on PRSA’s national board. That board work has taught me so much about how businesses and not-for-profit organizations function and about the challenges they face on a daily basis. All of that has made me a better practitioner. Even the most accomplished and well-regarded business professionals doubt themselves sometimes. Some quake at the idea of speaking to a large group (or even to just one reporter), but manage to pull it together and perform capably when they need to. That awareness taught me that it’s normal to question ourselves once in a while and to take a pause before proceeding. We just can’t let doubts cripple us. I often suggest that young professionals seek out a job (or a volunteer experience) with a not-for-profit organization where they’ll be asked to do a little bit of everything… media relations, newsletters, volunteer management, maybe even some fundraising… because not-for-profits are often short staffed and under funded so everyone has to pitch in. A young PR professional can learn so much in that kind of environment. I thoroughly enjoy working with the media and do so nearly every day. They often help me accomplish my objectives, and I hope I help them with theirs as well. It’s a mutually beneficial relationship, and I value and respect my colleagues in the media. 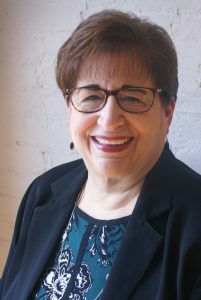 Meet Jo Ann at our Women in PR Panel on Friday, July 27 from 7:45 to 9:15 a.m. at URBAN CO-WORKS, 433 State St. in Schenectady. Click here to register now!